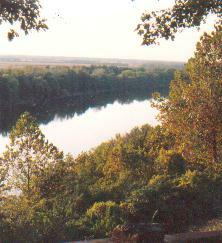 Indiana rivers are an important part of the geography and history of the state. The rivers and streams provide a sense of remoteness that can be found in few places in modern Indiana. Indiana could rightly be called the "State of Rivers". Most of the rivers are part of the Mississippi Drain basin while others drain into the Great Lakes system, flowing on to the eastern seaboard. I have traveled our waterways for many years and have been fortunate to experience the beauty, solitute, and adventure that they offer. Indiana rivers and streams are a great resource that relatively few take the opportunity to enjoy. It is my goal to provide information that will help people understand and appreciate our waterways. I invite you to explore our rivers and streams. My hope is that when you do, you will be a good steward of the river and leave no trace that you were there. The Wabash River is rich in history and an adventure to explore. It is the official Indiana State River. In the past 40 years, the river has improved greatly in water quality and access. This is a result of many dedicated people and organizations. There are, however, many who know so little about this natural resource. We hope you will get to know this and many other great rivers in Indiana. We are a state rich in rivers! The White River is actually two rivers that join only 45 miles from their end. Each has it's own charm. From rapids to gentle flow to agricultural land to the hills and bluffs of southern Indiana, this river has an amazing variety to offer. As with the Wabash, great things are happening on the White River. After many years of abuse and backs being turned to the river, it is making a come-back. The Indiana Dept. of Natural Resources and organizations like the Friends of the White River are making a difference in seeing that this river remains as natural as possible. This river is to explore and enjoy. If you do, please leave no trace that you were there. The entire southern border of Indiana is defined by the Ohio River, but many Hoosiers don't relate to it as being an Indiana river. Perhaps it is because the river is shared by several states, or because it is regarded as a commercial river. For anyone who has traveled the Ohio, the feeling that it is only a working river changes. The outstanding scenery, interesting river towns and remote areas are a great resource for recreational boaters from canoes to cruisers. The Ohio is a big river. Some places are over one mile wide and it is 981 miles long. There are many quaint river towns along with the natural beauty. The question often comes up regarding property rights and access to streams. It is a complicated issue and there have been court rulings concerning rights of individuals and property owners. The term navigable in the subject of access means one has the right to be there. It has nothing to do with stream conditions. Some streams listed as navigable waterways in Indiana have little or no water during dry times. If you are intending to explore a stream, click the link below to see if it is listed as an Indiana navigable waterway. This list is provided by the Indiana Natural Resources Commission. Another issue of concern to most river travelers is camping. Most land along our rivers is private owned, so we must be prudent and respectful when selecting a campsite. Islands and sandbars make great camps as long as there is sufficient elevation to insure that rising waters does not swamp the camp during the night. 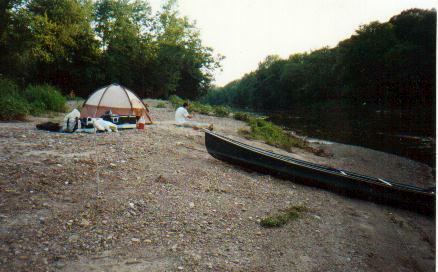 There are plenty of remote sections along the river banks to make camp and unless the land is posted or fenced, there should be no problem making camp. Never camp near a residence, factory, bridge or a road. Respecting landowners property means to stay quiet and clean up the site. Do not bury trash..take it with you until you can find a proper way to dispose of it. Never us a private dock without permission. If an area is cleared and tables or shelter is present then this is obviously someone's private camp. Again, there are plenty of remote places to go without setting up camp where someone may confront you. There are several organizations that encourage the use of our waterways and are active in keeping the rivers and streams clean. Pictured here is a river clean-up undertaken on the Wabash River called "De-Trash the Wabash". It was sponsored by the Wabash River Heritage Corridor Commission and several businesses. Many volunteers gave their time and energy to clean up the river near Lafayette, Indiana. right, produced by IDEM, makes the point very clear. to load your boat onto a trailer instead of using a winch. Powerloading creates a strong current that erodes and washes out the end of boat ramps. The soil or foundation under that ramp gets eaten away, causing the ramp to collapse. The damaged ramp can cause significant damage to your trailer. Powerloading costs thousands of dollars in repairs to equipment and ramps each year - money better spent on creating new ramps and opportunities for boating. Avoid damaging ramps and boat trailers by winching your boat onto your trailer. Sponsored by Indiana Waterways and the Vigo County Public Library in Terre Haute. Shown is author Jerry Hay with Berky Davis of the Indiana Canal Society and river enthusiast Dennis Meng. Meng's boat the Ouabache Guide was on display and used in a parade. The program inspired public awareness of this great river and was attended by many people interested in the Wabash River. The mayor of Terre Haute proclaimed the day "Wabash River Recognition Day"
♦When LaSalle first saw the mouth of the Wabash from the Ohio River he thought it was the upper Mississippi River. ♦There was a "Pearl Rush" to the Wabash in the 1920s after a pearl valued at $6,000 was found in a mussel. 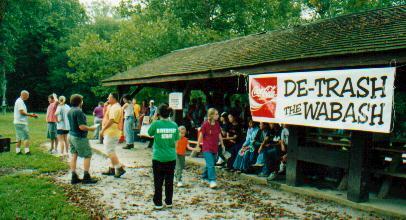 ♦10,000 years ago the Wabash was 8 miles wide (Deming Park to Derby Hill at Terre Haute. 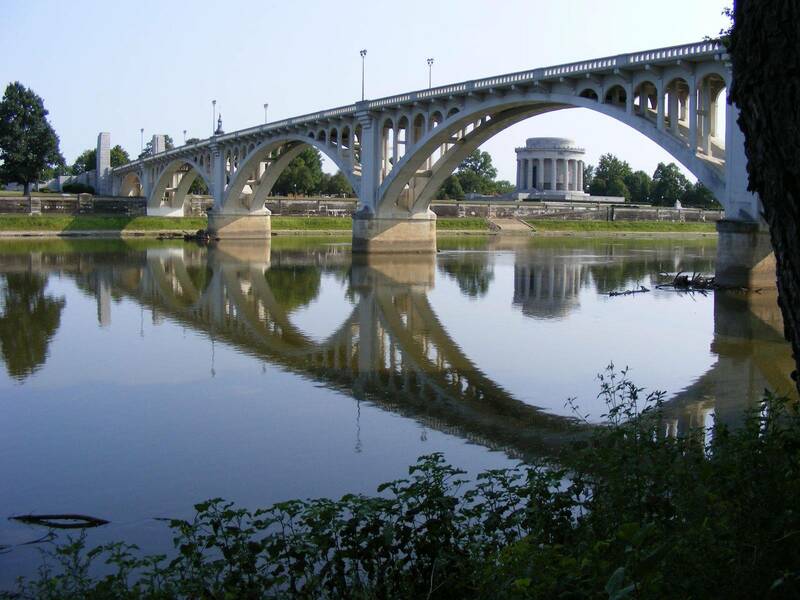 ♦The Wabash begins in Ohio, running north and ends at the Ohio River at the Kentucky border. ♦Wabash Indiana was the first electrically lit city in the w♦orld. ♦A derailed train engine still rests at the bottom of the Wabash at the old Penn Central bridge at Terre Haute. ♦A Terre Haute, the record high river stage was 31ft and the record low was minus 2ft. ♦The Wabash was called the "Avenue to the Midwest. ♦The Wabash was named Wah-Bah-Shik-Ka by the Miami Indians, meaning "Water flowing over white stones". ♦The term "Indian Summer" was first used by settlers along the Wabash for unusually warm weather during late winter. ♦Indiana's Lake Michigan shoreline is only 40 miles long but Indiana is still considered a Great Lakes State. ♦In the 1800s, canals were dug linking the Great Lakes to Indiana's river systems. The canals proved to be a financial disaster. Railroads made the canals obsolete, even before completion. 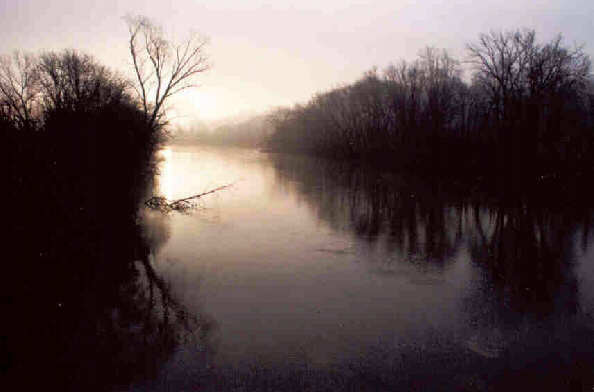 ♦Steamboats traveled as far up the Wabash as Lafayette and some made it up the White River, nearly to Indianapolis. ♦The official Indiana state song is "On the Banks of the Wabash, Far Away" by Paul Dresser. It was enacted by the 1913 General Assembly. ♦The Tippecanoe River twists and turns for 225 miles throughout northern Indiana but is only 70 miles distance (as the crow flies). 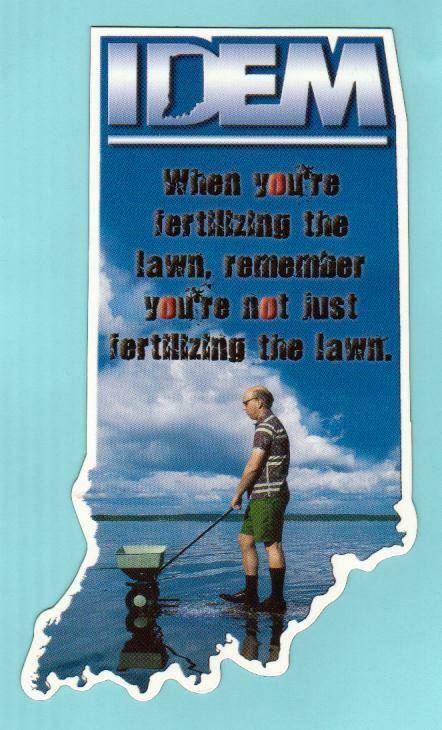 ♦Indiana has over 35,000 miles of rivers and streams. ♦What Indiana City was named for a characteristic of a river? South Bend was named for the shape of the bend where it is located along the St. Joseph River. ♦The Ohio River is an Indiana River (along with other states) but it actually belongs to Kentucky to the Indiana shore. The Northwest Ordinance gave Kentucky and Virginia (now West Virginia) the entire width of the Ohio River in 1784. ♦Johnny Cash wrote and recorded "If it wasn't for the Wabash River"
Do you know that there was a naval shipped named the USS Wabash, so named for the Wabash River? It was a 4808-ton steam screw frigate and was commissioned in August 1856, she initially served as flagship of the Home Squadron, then went to the Mediterranean in 1858-59. During 1861, the Civil War's first year, Wabash blockaded the Confederacy's Atlantic Coast and participated in the captures of Hatteras Inlet, North Carolina, and Port Royal, South Carolina. As flagship of the South Atlantic Blockading Squadron, she was an active force in the Blockade of Charleston, S.C., in 1862-64. Her Civil War service was climaxed by participation in the ultimately successful December 1864 and January 1865 assaults on Fort Fisher, North Carolina. This is a view of the Wabash River at Lafayette, Indiana in 1868. Illustrators made these birds eye views of cities with amazing accuracy. Check out our entire collection of historic river cities illustrations at River Cities.